Oracle Halo Fog Light Assemblies are the perfect solution for your vehicle. Oracle takes a set of brand new Depo OEM Style Fog Lights and installs a set of halo lights in them. You'll enjoy the great looks of halo lights while avoiding most of the extremely tedious installation process. Even if you already have OEM fog lights in your vehicle, in many cases buying these entire assemblies works out to be less than what a shop would charge to install halo rings into your existing fog lights! Fog light bulbs are also included!. 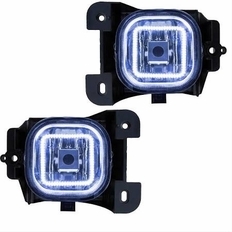 The part number for this item is 8115-001 and this PAIR of new fog lights fits 2004-2005 Ford Ranger (USA Models).